Your mind races with uncontrollable thoughts. You notice every itch and minor discomfort. You feel compelled to get up. Your must-do list calls to you like a Siren. You wonder, again and again, when your ten minutes will be over. You feel anxious, excited, distressed or overcome by other emotions. You try too hard and then feel more stressed. You begin to judge yourself for your restlessness. Generally, the remedy for restlessness in meditation is discipline, instead of reacting to the restlessness by jumping up, you simply notice it. By doing this, again and again, at least for some of us, restlessness will lose its power. But the practice of discipline doesn’t work for everyone. That's because, for many of us, both the physical and the subtle body are disturbed in a fundamental way. Without knowing this, you may give up on meditation altogether as impossible and continue on in non-stop activity, just making yourself more and more keyed up. But it’s not impossible to find the peace you need and so deserve. Instead of trying to force meditation, let’s take a deeper look at how to work with the fundamental disturbances within the subtle body. I’m going to ask you to keep an open mind because you might feel we are entering into the land of woo-woo. However, the subtle body has been recognized for thousands of years by eastern medical and spiritual traditions. If their solutions work, why not benefit from them? the tigle (drops, droplets, or sparks of life). You can imagine the channels as similar to the acupuncture meridians or the nervous system that extends throughout the body. The drops or sparks of life, akin to neurotransmitters, travel through the channels. They are carried by a force called the wind, which literally allows us to move physically, emotionally, and mentally. The winds’ home base is located about 4 finger-widths below the navel, called the vase region in Buddhism, similar to the dan-tien area spoken of in martial arts and qigong. When the subtle body is in balance, the channels are unobstructed, the wind is centered in its home and from there moves freely through the channels, and the drops flow with ease. Do you remember a time when you felt well in your skin, a sense of lightness, joy, and openness? That’s the subtle body in balance. In contrast, you probably have days when you feel out of sorts, heavy, depressed, angry or anxious, perhaps for no clear reason at all. That’s the subtle body out of balance. Imbalances in the subtle body can accumulate and grow stronger and stronger over time, sculpting your thoughts, emotions, and behavior in unhappy and unhealthy ways, and contributing to disorder and disease in the body. One major type of imbalance occurs when the wind becomes agitated and starts to run too rapidly or erratically through the channels. This can come about when we’re endlessly seeking happiness outside ourselves and constantly moving between hope and fear. That’s when restlessness and speediness set in, and can impact your whole life not just your meditation. When there's an imbalance in the wind, you may have trouble sleeping, get aches and pains, feel anxious and nervous, or suffer from exhaustion. Speediness breads speediness so it becomes harder and harder to relax the body, the mind, and the emotions. If you have trouble sleeping, read: The Sleep-Stress Connection: How to Get the Sleep You Need. How Can You Overcome Restlessness? If you’re hampered by restlessness in meditation or in life, what can you do? You can use a method called “vase breathing,” which brings the wind back to its home below the navel from where it can travel more smoothly through the channels. Because the mind rides on the wind, like a rider on a horse, when the wind is settled in its home, meditation happens more easily. Restlessness subsides as does excessive thinking and turbulent emotions. You begin to feel a sense of space between your mind and your thoughts and emotions, instead of being inseparably wed to them. Deep emotional patterns can begin to soften and gradually heal. Here’s the practice of vase breathing in a few simple steps. Sit comfortably with your spine straight but not rigid, allowing for its natural curve. Place your feet flat on the floor if you are sitting in a chair. Begin by just noticing your breath for a few minutes without trying to change it. If your mind wanders, just bring it back to noticing the breath. After a few moments, begin vase breathing. Start by exhaling slowly and completely. Gently bring the abdominal muscles as close to the spine as you can, but don’t use excessive force. Next, breath in slowly, allow your abdomen to expand, and imagine that you’re drawing the breath down to the area four-finger widths below the navel, the vase region. As you bring your breath and attention to this area, the wind will naturally follow and begin to rest there. Hold your breath in the vase region for a few seconds. Then, before you feel any sense of urgency, slowly breathe out. After exhaling and inhaling as above for three or four rounds, at the end of the last exhalation, try retaining a small amount of your breath, about 10% or whatever you can do, in the vase region. So that's three or four rounds of breathing followed by one round where you retain a small portion of the breath in the vase region. Repeat the process - steps 3 through 6 - for about 10 minutes, always working with your breath in a gentle fashion. If you find 10 minutes challenging, start with 5 minutes or even 1 minute. When you do this practice, you might feel calmer and more centered during or at the end of your first go. Or you might find it difficult or uncomfortable at first. Like any new skill, vase breathing takes practice. If you find it challenging to work with your breath in this way, just begin by moving your attention from your head to the vase area below the navel and allow it to rest there. That will already begin to calm the wind and thus calm the mind and the heart. Then when you feel ready, gradually begin to work your breath as well as your attention. When you practice vase breathing for 10 - 20 minutes each day, the winds will re-learn how to live in their home and travel smoothly through your channels rather than running about excessively. Slowly, you’ll be able to hold a small percentage of your breath in your vase region even as you go about your day. And if agitation begins to arise during the day, you can practicing returning the wind to its home right on the spot. Often, we blame or judge ourselves when challenged by emotional, mental, or physical patterns like restlessness, speediness, and worry. We don’t realize or don't take into account how deeply these patterns have been embedded in our being through years and years of accumulated conditioning. They can't be changed by speaking harshly to yourself. If you feel restless and find it hard to settle down, you're not alone. Restlessness could be considered a 21st century disorder. Considering all these factors, please be gentle with yourself as you go about learning to bring the wild wind back to their home. Peace is within your reach. By learning to work with your breath and thus the wind, you will find your center and feel at peace once again. 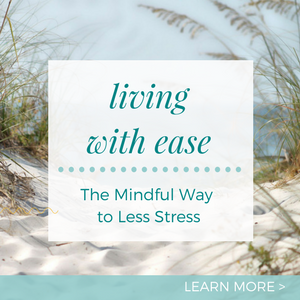 Do you find it easy to relax or do you feel plagued by restlessness? I would love to hear. Please leave your thoughts below. Important Note: If you are living with anxiety, ADHD, or breathing problems, check with your psychotherapist or doctor first before engaging in a breathing practice like this. Sources: I received oral instructions on this practice from Tsoknyi Rinpoche, who subsequently brought them together in one chapter of his book titled Open Heart, Open Mind: Awakening the Power of Essence Love(affiliate link), which I highly recommend.